This lovely wedding invitation was folded and sealed with the blue silk feather shown in the photo. We carefully removed the feather and used it to cover the fold in the invitation. We backed the invitation with a medium blue raw silk to accent the blues in the piece. We used a simple silver frame and ultraviolet reflecting glass placed on top of an invisible acrylic spacer to provide an air space between the invitation and the glass. 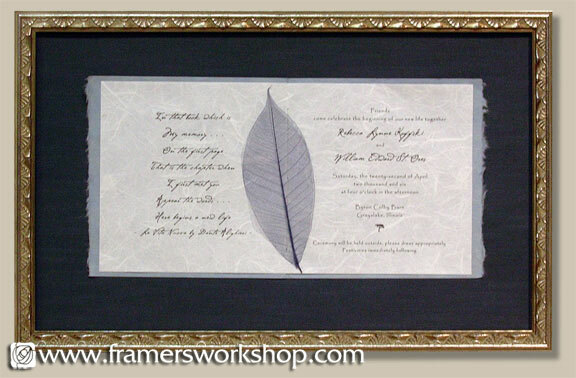 For more framed invitations see our Celebrations Page.